A unique and incredibly impressive vintage computer, and also a thoroughly exotic way of enjoying the rare delights of Laserdisc gaming, has appeared on eBay and you can bid on it via this Pioneer Palcom MSX Laserdisc System auction. 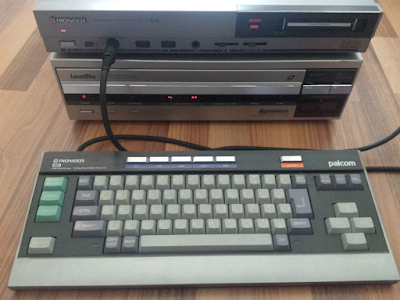 The winning bidder shall be getting the very unique, and very multimedia Palcom PX-7 MSX-1 8-bit micro, the LD-700 Laserdisc player, and every LD title ever released for the system each with its manual and plastic sleeve. The included discs are: Astron Belt, Badlands, Cosmic Circuit, Esh's Aurunmilla, Inter Stella, MysteryDisc, Rolling Blaster, Space Discs (on 5 discs), Star Fighters, Strike Mission, and Umi Yulaba. Seller ships to quite a few places worldwide.